4 Bedroom Detached House For Sale in Bedford for £875,000. This deceptively large property, located in Bromham 3.7 miles outside of Bedford, comes with a log cabin, containing spa pool and bar. The property offers an abundance of versatile living space and a brilliantly clean canvass with which to work; offering the opportunity to bring your our design features. The kitchen is a large, user friendly open area, also offering plenty of space for family dining. With well maintained units and plenty of storage the kitchen decoration offers a fresh clean bright feel. The utility room situated to the rear of the kitchen offers access the garden and garage at the side of the property. The first of two sitting rooms is situated to the front of the property it offers a warm cosy family area, with a traditional open fire: a perfectly tranquil area to relax with family or friends. The second sitting room is to the rear of the property, with large patio doors offering views of and access to the garden. The room has a contemporary feel with a modern wood burning stove. Once again a fantastic room for family or entertaining. The large dining room is situated to the front of the property; plenty of room for formal dining or entertaining. Leading from the dining room is the secluded area currently used as a library/study. In addition to the above on the ground floor is a toilet/shower room, an under-stair cloakroom and a boiler room. All of the above rooms are accessed from a spacious parquet floored hall. The master bedroom is set to one side of the property with dual aspect windows. The room contains storage and airing cupboard. It is situated in a quieter part of the property offering a tranquil resting space. There are three further double bedrooms on the first floor. The first set to the front of the property, the second situated to the side of the property, currently being used as a music room. The third bedroom is situated to the back of the property and offers a unique feel with built in storage, currently used as a craft room. The family bathroom, situated to the rear of the property, is bright, clean lined with an airy feel and contains a large, feature bath tub. All the above are accessed from a large landing, as is the loft space. The property offers front and rear gardens, open plan to the front of the property fully enclosed and private to the rear. Gardens offer lawned areas with various trees and shrubs. The large rear garden currently contains two sheds, a workshop and log cabin. There is ample off road parking to the front of the property and there is drive access to the side and rear of the property if required. To the rear of the garden is a beautiful, large, rustic style log cabin. Currently used by the owners as a gymnasium. The, centrally heated, log cabin contains a spa pool which includes Jacuzzi, swim jets and light. The log cabin also has a well thought out bar and seating area. Outside the log cabin is a tranquil decked seating/ barbecue area. This is a unique addition to any property, offering the perfect get away to rest and relax with friends and family. The building may offer the opportunity for conversion to an independent Annex. The beautiful village of Bromham is located just less than 4 miles from Bedford town, which offers a wide variety of shops, restaurants, university and entertainment. 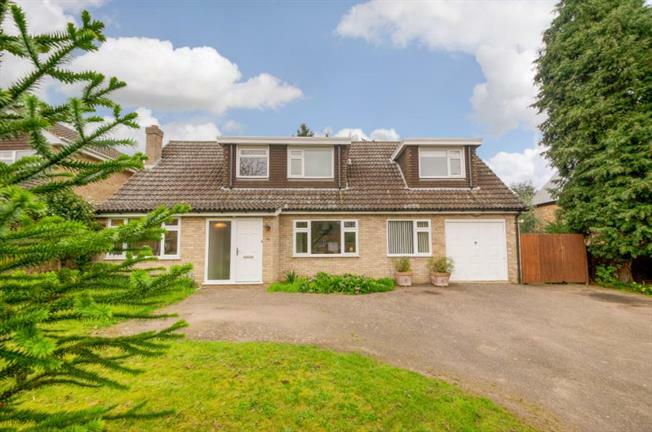 The property is situated in a sought after location, with easy access to local amenities, train station, Milton Keynes and the Harper Trust schools.